Part V: my last Iceland post and I had the hardest time narrowing down all the photos for this last roundup! This post is all about the northern fjords we visited our first few days in Iceland, because why not blog about the first part of a trip last? Makes total sense, right?! For real though, the fjords were beautiful, super remote, and the best introduction to Iceland and Icelandic culture. Not many tourists make it so far north, but if you ever are in Iceland, you should definitely make the trip up there! The first photo is from one of our many dark morning walks to breakfast. The sun didn't even start to rise until well past 9:00 am. But the darkness and quiet, coupled with the crunch of fresh snow under my boots, lent a certain coziness to those morning walks. I was so freaking cold in this photo, despite wearing my best base layer, a thermal zipup, a down jacket and a wind breaker.. We were about 50 miles south of the Arctic Circle and trudging through 2 feet of snow during a three hour outdoor tour.. At least we weren't being pounded my gale force winds and snow like we had been the day before! 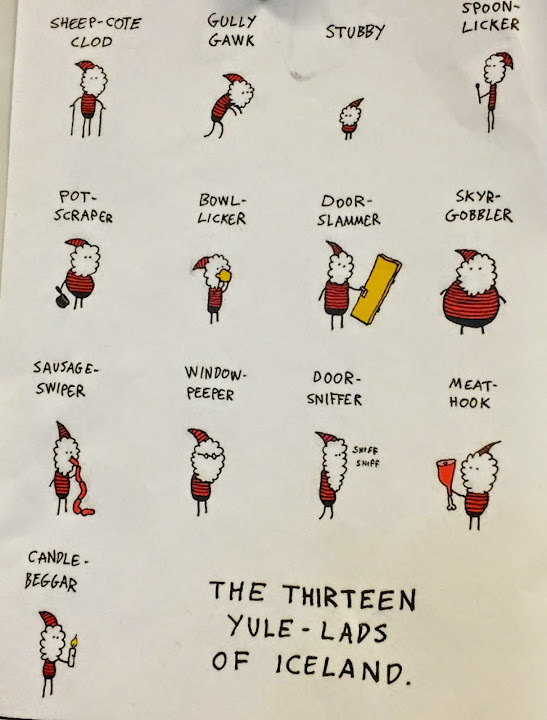 Another one of my favorite Iceland facts: instead of 1 santa they've got 13 naughty yule-lads, these are their names translated into english.. there are certainly some interesting ones. The yule lads also are related to this giant evil cat that boils naughty children into soup on Christmas.. So that is pretty terrifying! And keep in mind that this is the tame version of the story, the originally version was actually outlawed in the 1740s for being too scary for children! the best fish soup I have ever had! Iceland knows how to do fish! How to explain this.. We went to a pagan ceremony one of the nights in Iceland, but it was totally cool and not creepy or dark at all! Basically it was just a renactment of traditional nature ceremonies and some chanting of Icelandic poetry as a way to honor the olden days. It was actually my FAVORITE part of the whole trip, mostly because we got insanely lucky and saw the northern lights. We thought our chances at glimpsing them were pretty good, but we had no idea what was in store. 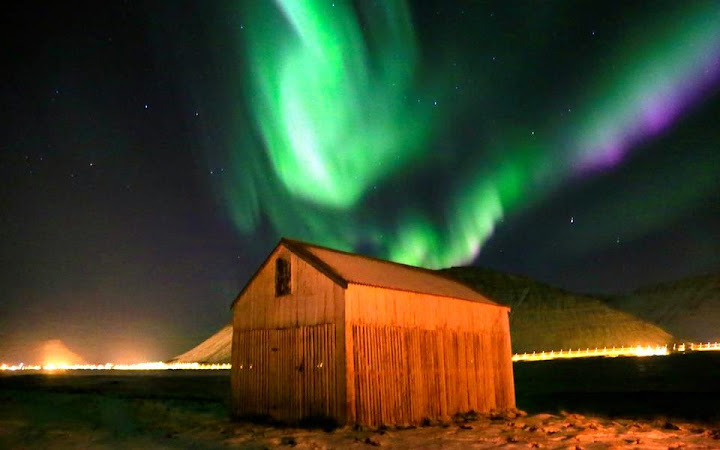 As we were gathered around this bonfire listening to old icelandic poetry under the stars the northern lights burst above us and we had the most beautiful view in the world. We all had our heads titled back and were mesmerized by them. Even the Icelandic woman reading the poetry had to stop and admire them because they were so incredible. So many locals later in the trip told us that the lights that night were the best they had seen in about 3 years!! Photos will never do it justice becuase you can't really capture their movement, and they are always moving! That is the thing that I didn't expect was how they truly seemed to be dancing around the sky, you could see them swaying and bending and twisting.. I wanted to cry it was so beautiful. Of course all I had on me was my iphone, and even though those photos turned out surprisingly well, I asked one of my good friends if I could borrow two of his photos because he had a tripod and they much better reflect what we saw! the green is a lot easier to capture on camera than the purple and pink, but we certianly so those colors too! And it truly was as bright and colorful as it is in the photos. Funny story about this boat: Has anyone seen Walter Mitty? Well (spoiler alert) he is looking for some clues based on photos he has including one photo is of a thumb, he is astounded when he indeed finds the person who's thumb it is and the person just flatly responds "It's Greenland.. there's like 10 people here, it is a good place to find a thumb." Well Icelandic population is much larger than 10, but it is a very small, close knit community where everyone seems to know everyone. In this particular town where we stayed for a few days there are just over 2,000 people. So it is quite small, but the largest (by far) in the area. I instagrammed this image and an Icelander somehow found it and commented "Hey, that is my Grandpa's boat!" hahaha I just had to laugh! Only in Iceland! Also, this picture was taken right before we were pounded by a huge winter storm, so I love the ominous dark clouds brewing in the background! 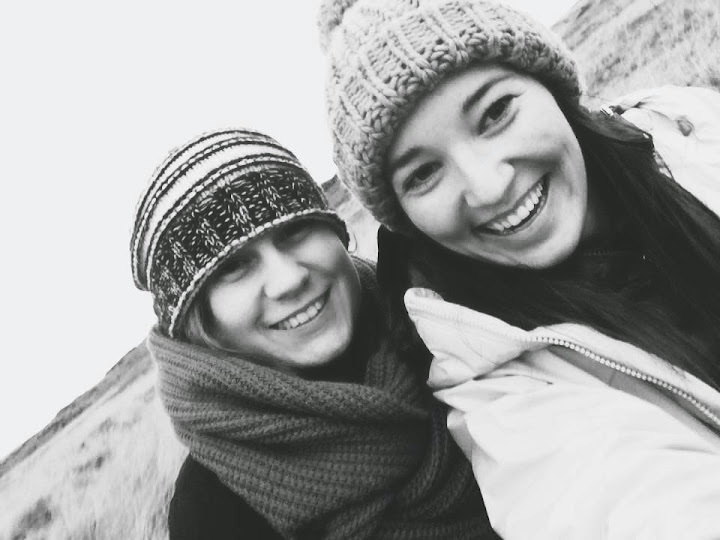 And with that, so concludes my Iceland 2014 Travel round up! This trip will always go down in as one of my favorites, our group was amazing, the landscapes were unbelievable, and I felt like a grand adventurer the whole time! Not to overdo it, but two of my friends made videos of our travel, they are gorgeous and worth a watch! Thank you Pierre and Maddi for sharing your talents with our group! Icelandic Poetry from Pierre Garcia on Vimeo. 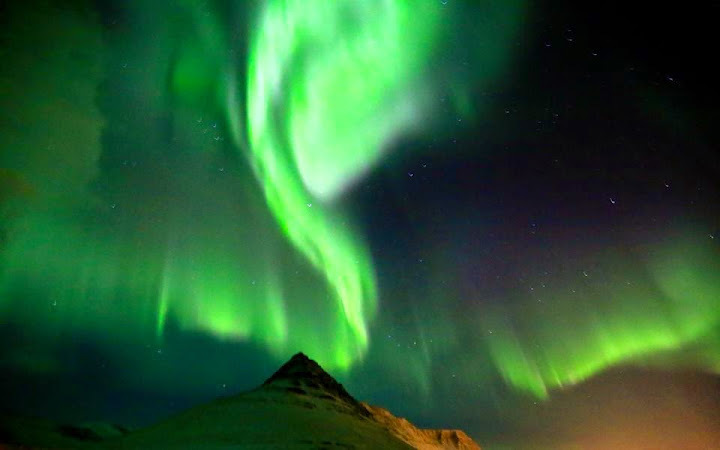 Roaming Iceland (Fall 2014) from Maddi Stevens on Vimeo. Farewell Iceland, or (as they say it in Icelandic) bless bless! Amazing photos! I am sure you have stated this somewhere before, but what camera do you use? Hi Kayla, half these photos are from a Nikon D7000 and the other half are from my iPhone! The aurora is amazing! I almost caught it when we lived in North Idaho, I really wish I did! Also love the green roof houses! We stayed in one in Norway a few years ago. okay. i need to go to iceland. NOW.